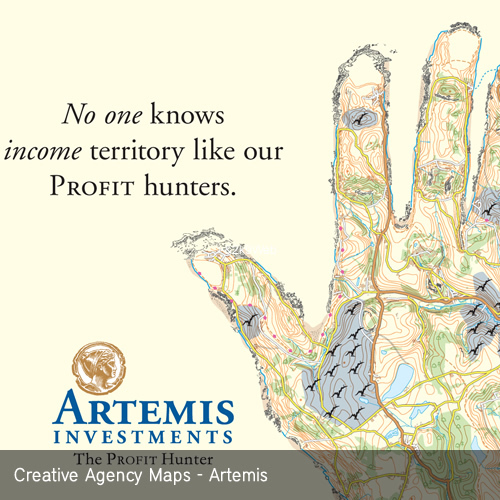 Lovell Johns were approached by London creative agency Libertine to produce a map graphic for their latest execution in the long-running “Profit Hunter” campaign for Artemis Asset Managers. Following a quick design consultation, Lovell Johns were chosen to provide the specialist cartographic design skills necessary to achieve a balance between the map looking as authentic as possible, whilst still being recognisable as a hand. Paths, buildings, ridges, coastal and other features were used to hint at the various nuances of a hand, without ever being overtly obvious in creating the shapes. Lovell Johns worked closely with Libertine’s Creative Director, Russell Wailes, to ensure the correct ‘strength’ of the map was achieved to satisfy the request that the viewer should “see the map first and the hand a millisecond later”. The advert will run in the trade press, on selected poster sites and taxis in London and possibly in small space ads in the national press.See the creative agency mapping out and about in Edinburgh.